Le Méridien overlooks Monte Carlo and the Mediterranean Sea. Its private beach and indoor and outdoor swimming pools are complimented by a range of restaurants and bars with 24-hour service. Rooms at Le Méridien Beach Plaza are air conditioned and each has a private bathroom. All rooms come with a flat-screen TV with cable channels. Le Méridien Beach Plaza offers 24-hour food and beverage service in a variety of venues that make use of the hotel’s panoramic views. Alang Bar is a relaxed outdoor lounge on the hotel’s private beach. The L’intempo Restaurant features live cooking and creative Mediterranean cuisine. The hotel’s fitness center offers a TechnoGym cardio training room. Guests also have access to the hotel sauna and beauty salon. Le Méridien Beach Plaza hotel is a 2-minute walk from Grimaldi Forum Conference Center. It is 22 miles from the Cote D’Azur Airport. Located in Monaco, this elegant hotel offers guest rooms with free Wi-Fi access and a minibar. It is just half a mile from the Princely Palace and a 3-minute drive from Monte-Carlo Casino. All air conditioned guest rooms are equipped with a TV with cable channels. Some rooms at the Ambassador-Monaco feature a sitting area. Each guest room has floor-to-ceiling windows offering plenty of natural light. Ambassador-Monaco features a pizzeria serving traditional Italian cuisine. Guests can enjoy a drink in the hotel bar. A buffet breakfast is served every morning. Monaco Train Station is a 4-minute drive from the hotel and Port Hercule is half a mile away. This hotel features a rooftop terrace with views of the Circuit de Monaco and is between the Mediterranean Sea and the Casino of Monte Carlo. The hotel has a pool, restaurants and a spa. A complimentary shuttle service goes to 4 nearby Monaco beaches that have special agreements with the property. Every guest room and suite is air-conditioned and has a work desk and interactive TV. All of the rooms feature a private marble bathroom and a private balcony. Guests can choose a room with views of either the sea or the garden. Fairmont Monte Carlo features 1 restaurant serving Mediterranean cuisine with a panoramic view of Monte Carlo and the sea. The hotel bar-lounge is open 24 hours a day. The Fairmont’s rooftop pool is heated and has views of the Mediterranean Sea. Guests can also take advantage of the Willow Stream Spa, which has a fitness center and offers a variety of beauty treatments. In the heart of the Principality of Monaco, Novotel Monte-Carlo is a short walk from the train station, Place du Casino and Grimaldi Forum. It features a seasonal outdoor pool with lounge chairs, a fitness room and a hammam. All air-conditioned rooms and suites at the Novotel Monte-Carlo are furnished with a desk and free Wi-Fi is provided throughout. Each has a private bathroom and some rooms have a view of the swimming pool and garden. The hotel serves a variety of breakfast options including a breakfast buffet, room service and a quick breakfast is available in the bar. The NovotelCafé, which opens onto the garden, serves Mediterranean cuisine and there is an on-site bar serving snacks over lunch and dinner. Guests have access to 2 computers on site. Casino de Monte-Carlo is less than half a mile from the hotel and Port Hercule is less than a 10-minute walk from the Novotel. The Rock of Monaco is a 20-minute walk away. Port Palace is a 4-star boutique hotel in Monaco overlooking Port Hercule. It features a location at the epicenter of Monaco's legendary Grand Prix circuit and the Monaco Yacht Show. Guests can relax at the on-site spa with a hot tub and hammam. All of the luxury air-conditioned guest rooms at Port Palace have satellite TV and a minibar. Each has a private dressing room and private bathroom complete with a whirlpool bathtub, bathrobe and slippers. Free Wi-Fi is provided throughout the property. Restaurant La Marée serves fresh fish and seafood, and guests can dine on the terrace overlooking the marina. Guests can shop in Monaco’s large range of luxury stores nearby and the famous Monte Carlo casino is just a 6-minute walk away. Access to Monaco Train Station is a 5-minute walk from the property. Private parking is available on site and Wi-Fi is available throughout the hotel. Set beside Port Hercule in Monte-Carlo, Miramar offers a rooftop restaurant and lounge bar with panoramic views of the sea and the Circuit de Monaco. It is just 400 metres from Monte-Carlo Casino. An LCD TV and free Wi-Fi are provided in the air-conditioned rooms. Each room has a classic décor and views over the port. Some rooms also offer a balcony. Enjoy traditional cuisine in the restaurant or on the terrace, where guests receive a 10% discount. A continental breakfast is prepared every morning. The beach is 1.4 km from the hotel and Monaco Train Station is a 200 metres away. In a palace listed as a historic monument, this luxurious hotel with a Belle-Époque décor is 650 ft from Monte-Carlo Casino. It features an atrium and guests can access the 71,050 ft² spa. A minibar, flat-screen TV and antique furnishings are featured in the individually decorated and air-conditioned rooms at Hôtel Hermitage. Each room has a view of the city, garden or the sea. A DVD player and video games are available upon request. Vintage wines are served in the CrystalBar, with its leather armchairs. Savor gourmet cuisine in the Vistamar restaurant, which has a terrace offering harbor views, and enjoy freshly made pastries in the Limùn Bar. You can request seawater treatments and enjoy a sauna session, and the fitness center offers a panoramic sea view. Free Wi-Fi is available in the hotel lobby. Nice Airport is a 30-minute drive from the hotel and a helicopter service is possible upon request. Free shuttles are provided for access to the private beach. Situated on the Larvotto peninsula, this hotel with 4 restaurants is surrounded by 4 hectares of gardens on the sea front. It offers a casino, a 900 m² spa and a sand-bottomed lagoon with waterfalls and hot tubs. Each air-conditioned and individually decorated room at Monte-Carlo Bay Hotel & Resort has a flat-screen TV with video games and a balcony with views of the surrounding area. The en suite rooms are spacious and modern in design. Guests can choose between a buffet breakfast, a continental breakfast or an American one. Marcel Ravin is the chef at the hotel restaurants, 2 of which are situated in the gardens. After a workout at the gym, guests can play billiards or relax by the pool. Guests can also have a treatment at the spa or order a love seat for 2, both at an additional cost. The hotel with private helipad is situated 30 minutes from Nice Airport by car and 7 minutes by helicopter. It is an 8-minute car ride from Monaco-Monte Carlo Train Station and has a jetty for access by boat. 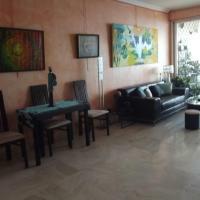 This self-catering studio is located in the heart of Monaco, less than 10 minutes’ walk from the town’s main port. It is spacious and features a balcony with a view of the city. Studio Monaco has a flat-screen TV and a dining area. The kitchen includes an induction stove, a refrigerator and a kettle. The bathroom has a bathtub. Monaco Train Station is less than a 10-minute walk away, while the Opera Garnier, Monte-Carlo Casino and Métropole Shopping Centre are all at less than 5 minutes’ walk. 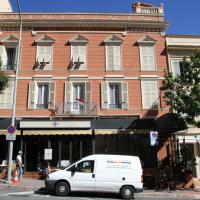 Studio Monaco is a 30-minute drive from Nice Côte d’Azur Airport. Located just 500 metres from the Palais Princier, Hotel Versailles offers a 24-hour reception, free Wi-Fi access throughout and a restaurant. The Casino is just a 5-minute drive away. All rooms are air-conditioned and feature a TV, wardrobe, soundproofing and heating. The en suite bathroom includes a hairdryer and free toiletries. A continental breakfast is offered each morning at Hotel Versailles. Guests can also sample French or Italian cuisine in the hotel’s restaurant. Port Hercule is just a 6-minute walk away and Stade Louis II Stadium is a 10-minute walk from the hotel. Nice Airport is ideally located 30 km away. Situato nel centro di Monaco, a 15 minuti a piedi dalla Rocca, l'Appartement Sainte Dévote offre una sistemazione con ristorazione indipendente e servizi gratuiti quali il parcheggio privato e la connessione Wi-Fi nell'intero alloggio. Situato ai piani superiori, l'appartamento è accessibile tramite scale e presenta un'area salotto con divano, TV a schermo piatto e lettore DVD, una lavatrice, un ferro da stiro, un armadio e l'aria condizionata. Il bagno in comune è dotato di doccia, asciugacapelli e servizi igienici. Nella cucina completamente attrezzata troverete una zona pranzo, un piano di cottura, un forno, un frigorifero, una macchina del caffè, un tostapane e le stoviglie. L'Appartement Sainte Dévote dista 5 minuti a piedi dal porto e dai suoi ristoranti, 3 minuti di cammino dalla stazione ferroviaria di Monaco e 25 km dall'Aeroporto di Nizza. In Monaco, Appartement Larvotto features self-catering accommodation with a balcony offering sea views and views of Monaco. Free Wi-Fi, concierge service and a washing machine are provided. The 2-bedroom apartment features 2 bathrooms with bathtub, a living room with a flat-screen TV and cable channels and a balcony. The kitchen is fully equipped with microwave, oven and stove. The beaches and the centre of Monaco are just a 5-minute walk away and Monte Carlo Casino is a 10-minute walk away. Monaco Monte Carlo Train Station is 1 km away, while Nice Côte d’Azur Airport is 25 km away.